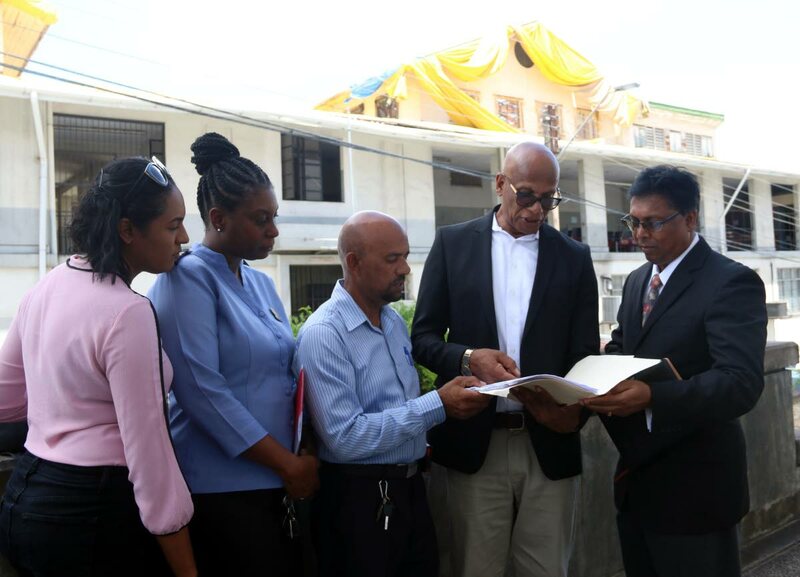 CONCERN: (from left) Building inspector Candice Brooker, public health inspector Natasha Howard, building inspector David Mohammed, mayor Junia Regrello and attorney Ramesh Deena look at some documents in front of the dilapidated San Fernando Magistrates’ Court on Wednesday. TAKING the court to court. That is the option San Fernando mayor Junia Regrello is considering in light of the Judiciary’s failure to complete roof repairs on the San Fernando Magistrates’ Court. Regrello held a news conference outside the unsightly structure on Wednesday afternoon, along with Natasha Howard — public health inspector, building inspector Candice Brooker, building inspector David Mohammed and president of the Assembly of Southern Lawyers Ramesh Deena. He said since January the different arms of the corporation have been communicating with the Judiciary to resolve the issue, but their correspondence have been ignored. Regrello said he had no choice but to use this medium to attract the attention of the appropriate people as the building is a health hazard, may be structurally unsound given the exposure to the weather conditions, and worse it is unsightly. Regrello said school will be opening in a few weeks and the court, which has become a breeding ground for mosquitoes, could pose a risk to the children at nearby institutions. Deena said magistrates’ courts and high courts are now sharing the same courtrooms on a shift basis. “You have a magistrate sitting at three hours for the most, to deal with hundreds of matters. This must be frustrating for magistrates themselves and for all of the attorneys who practise in San Fernando and those who come from the outside for matters. He said the lawyers’ association which he heads has suggested the nearby, underutilised Industrial Court as an alternative, but the suggestion has not been heeded by the Judiciary. Deena said they are looking at other options as the repair is likely to go on for another year as tenders are now being sent out for the roof repair. Reply to "Mayor wants to take Judiciary to court"